After school shooting, how do we stop the violence? 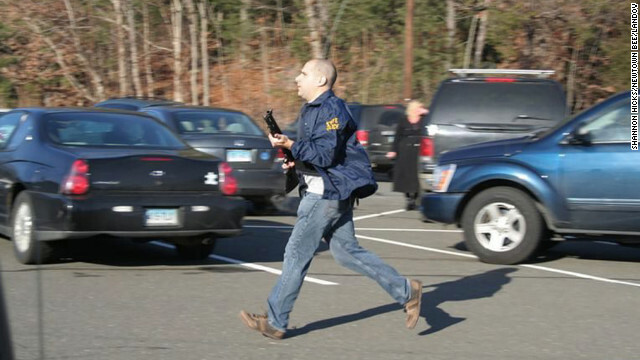 A Connecticut State Police officer runs with a shotgun at Sandy Hook Elementary School in Newtown on Friday, December 14. People around the world ask, simply: Why? Watch CNN's LIVE TV coverage of the Connecticut elementary school shooting as the story continues to unfold. (CNN) -- As the story of the tragic Newtown, Connecticut, elementary school shooting unfolds, many people are pondering: Why has there been so much violence in the U.S. lately, and what can be done to stop it? This year saw a mass shooting of movie theater patrons in Aurora, Colorado; the sentencing of Jared Lee Loughner on 19 counts, including murder and the attempted assassination of congresswoman Gabrielle Giffords; and the first overall rise in U.S. violent crime in nearly two decades. And as the world heard about the Connecticut school killings, many people took to social media to express their frustration. We're universally shocked and horrified by these tragic events. The question is: What do we do now? A simple search for "WTF?" on Twitter turns up an outpouring of frustration over this story. And the comment threads on CNN.com lit up with debates over gun control. So now what? CNN would like to hear from you. Tell us what you think needs to be done to help control violence in the world. Where do you think we should channel our frustration? Is it better gun control? Readily available health care? More money for policing and emergency response? Share what you think society needs to do to stop the killing. Tweet your ideas with the hashtag #nowwhat, or share your thoughts in the comments below. If you're in Newtown and would like to share images, or you have remembrances, please upload them to CNNiReport.com.